We may not think first of Bay Ridge when we think of barrel-fronted attached limestone row houses lining sun-dappled city blocks. But they do exist, and this one at 456 74th Street asking $1.575 million is a fine example. 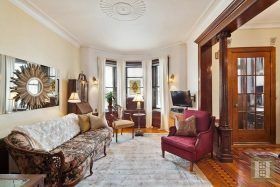 This turn-of-the-century townhouse is filled with meticulously restored original details like 10-foot ceilings, oak parquet floors with detailed inlaid borders, pocket doors and fluted oak columns while offering a modern kitchen and bath, basement family room and plenty of play space indoors and out.